Israeli soldiers attacked, Saturday, dozens of Palestinians, who marched near the northern entrance of Bethlehem city, in the occupied West Bank, wounding dozens, including a journalist. 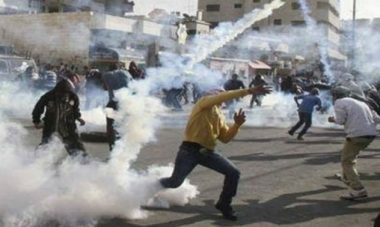 The soldiers attacked the Palestinians, who marched from the center of Bethlehem city, and headed towards its northern entrance, before the soldiers fired dozens of gas bombs, concussion grenades and rubber-coated steel bullet, at them, and many surrounding homes and buildings. Medical sources said many Palestinians, including Ma’moun Wazwaz, a cameraman working for Reuters, suffered the severe effects of teargas inhalation. In related news, the soldiers attacked Palestinian shepherds, in the Northern Plains of the occupied West Bank, and abducting one of them, identified as Ezzeddin Ka’abna.